CHICHESTER produced an excellent all-round team performance to overcome Pagham and record their first victory of the season. Pagham had eight former City players on duty, including three from the side who won the league title ten years ago. 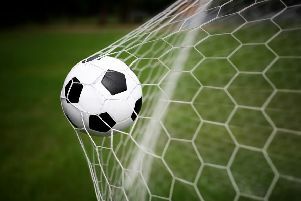 In a rough and tumble contest, Chichester seized the initiative after only eight minutes when Josh Case broke through on the right and fired the ball past James Binfield for his fifth goal of the season. It was almost 2-0 a few minutes later when two City players went for the same ball and Binfield was forced to save. The pace was terrific throughout the first half in an increasingly-physical battle. Five players were booked, with several others getting off lightly as the referee tried to calm things down. Home supporters braced themselves for a Pagham onslaught after the interval, but it never really materialised. James Temple – back in the Lions’ team after playing beach soccer for England during the summer – was supplied with two decent chances but he lacked his usual sharpness. The Pagham players shouted for a penalty on 65 minutes, claiming the ball had hit Corey Heath’s arm as he chested away, but the referee ignored the appeals. “It was a great result,” said City joint boss Sean Forry. “We had strengthened our squad with two signings and had a couple more returning from absence but, on the whole, the only difference between Saturday and several of our previous games was a bit of belief. “I thought we played well in the first-half and deserved our lead. “Pagham, however, are full of gifted players and their three lads up front would worry any defence, so the message to the players at half-time was that we had to improve our passing, keep hold of the ball and play in their half as much as possible. Regarding the months ahead, Forry said: “My view has not changed from the start of the season. I expect a much more comfortable ride in the league than last year. Joint boss Neil Sherlock added: “Sean and I are delighted for the lads to get their first win - they fully deserve it for all the hard work and commitment they have put in over recent weeks. “I’m also very pleased we held on to a lead and saw the game out and kept a clean sheet. The spine of our team was brilliant with Ender’s great ability and presence and Hibbert’s captain’s performance, which got him man of the match. “Case was inspirational and fully deserved his goal and Gromett at just 17 led the frontline like a man beyond his years. CITY: Ender, Heath, Madden, Boniface, Hibbert, Case, Groom, Cody, Gromett, Blatchford, F Smith. Subs: Forry, Ansa, van Driel. PAGHAM: Binfield, N Murfin, Cox, Pearce, Geoghegan, Bradshaw, Briggs, Cutler, Neighbour, S Murfin, Temple. Subs: Williams, Ford, Hardwell.